My Orange Brompton: 200,000 Page Views Special Competition! On Thursday, 10th January 2013 I reached 100,000 page views and was rather pleased about it all. Today I have passed the 200,000 mark and managed to achieve this in five months. 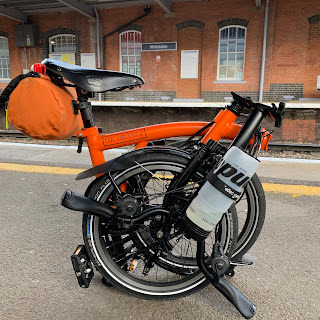 This blog started out as simply an online diary of my own personal journey from buying a Brompton, starting to commute on it, trying to get fitter and logging the many adventures I seem to end up on. Nothing has really changed and it is still that however it has been great to hear from so many readers all across the world about how you have read my exploits only to start embarking on your own. Many of you have gone out and bought your very own Brompton which is great (I should be on a commission from Brompton really). Some of you have bought other bikes or got an old bike out of the garage and started using it again. All of this is really heartening to hear as cyclists are all on the same team after all. Your comments, emails and kind words are always appreciated and although I cannot replay to them all (although I do my best) I certainly read them. I thought I would mark reaching 200,000 page views with a mini competition. The prize will a medal with an orange ribbon to the best caption for the photo below. All you have to do is post a comment for this blog entry and I will have a good look at them and decide which one is my favourite (assuming I get any that it) I will post the medal and a few other orange souvenirs to the winner. The closing date will be 01/07/13 so you will have lots of time. I am just so happy to have reached this major milestone and only hope that I can continue to entertain you. It is certainly going to be a busy few weeks and I will have lots to tell you about. So keep reading and commenting and thank you whoever you are...wherever you are for reading!! Very - early - in - the - morning. An Orange Brompton Bike, the path to Spiritual enlightenment. 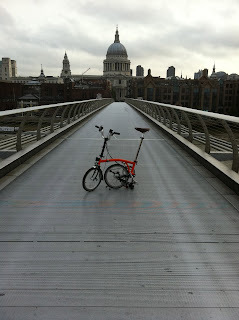 My heart stopped a moment when I thought my Orange Brompton took a road trip without me. No clever entry from me, but congratulations from another orange Brompton over here in Toronto, Canada. Just wanted to say keep up the great job on the blog! "London, damn I miss that place"
The back story is that I was in your neck of the woods last summer, and I crossed the Millennium Bridge after watching Henry the 5th at the Globe on my first night in town. I stopped in for a pint at the Viaduct Pub just behind St. Paul's, and then made my way back to Notting Hill (where I was staying). In 3 days I put about 30 miles on "Boris' Bikes", riding all over town. Your blog brings back a lot of great memories. Thanks.